It’s Mid October, just the right time, so I am posting this reminder! Strawberry Runners! Mid Oct cut off runners, gently dig up if they have rooted, shake the soil off. Clip all but two or three leaves off, tie ‘em together in loose bunches. Plastic bag them and put in the back of your fridge for 20 days. Plant them Nov 5 to 10! Prechilling your plants makes them think they had a cold winter. When days get longer and warmer, they will produce fruit, not as much vegetative growth. You can then either keep your plants that produced this year, or remove and compost them, start fresh with new plants! Online you will read to pluck the flowers from first year plants, letting them get well established, then getting a great 2nd year crop. Commercial growers plant new plants every year and harvest those first year plants. Can you plant strawberries from seed? Sure! When I eat strawberries at the garden, I leave a little flesh on my strawberry tops, toss them into a dampish spot in the garden. When the birds or bugs have gotten to one too much for me to eat, or I missed it under leaves, and it is too past its prime, I push back the soil right at the surface, pop the strawberry in, leaving the top of it just barely covered. Just like planting tiny lettuce seeds, just barely covered. The decaying fruit is a perfect medium for growth! Here and there, later on, I find new plants starting that didn’t come from runners! The more deliberate way of doing this might be to take a package of strawberries you didn’t eat in time, slice ’em, if they are still sliceable, and plant them. Or, just buy a pack of seeds at the nursery and go for it, September and April being the best times of year to plant them! First, put them in the fridge or freezer for 2 weeks. This will improve the percentage of seeds that will germinate, when you plant them. Freezing stimulates the natural process of the seed going through the winter months and will help jump start the strawberry seeds when you plant them. Since the seeds are tiny, and sprouts will be very tiny, be sure to mark off that area so you will water very gently there, with your sprinkler can, so you don’t wash them away. No flooding, ok? Just keep them moist. Transplants are easier and more sure; seeds are less expensive. 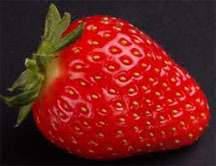 Either way, happy eating – strawberries are low in calories, high in Vitamin C!